Today's day saw yet another team, Karnataka qualify for the semi-finals of the Ranji Trophy 2018-19. They made it through with a six-wicket win over Rajasthan. Starting the day on 45 for 3, nightwatchman Ronit More was dismissed early. Captain Manish Pandey and Karun Nair steadied the ship and remained unbeaten while putting 129 runs for the 5th wicket to take their side to just two matches away from a title this season. Vidarbha is in a commanding position after the end of day 4 at VCA Stadium, Nagpur. Starting the day on 559 for 6, they were bowled out for a massive 629 runs with Aditya Sarwate scoring 102. With the mammoth first innings score, Vidarbha took a massive lead of 274 runs. In their second innings, Uttarakhand openers Vineet Saxena and Karn Kaushal began well by adding 72 runs for the opening wicket before Vidarbha bowlers reduced the Plate Group topper to 152 for 5 at end of day 4. The match between Saurashtra and Uttar Pradesh is heading towards an exciting finish on the 5th and final day. Starting the fourth day on 172 for 8, Uttar Pradesh were bowled out for 194 runs. Set with a target of 372 runs, Saurashtra openers Harvik Desai and SS Patel set a solid foundation adding 132 runs for opening wicket. VM Jadeja and Harvik Desai added another 54 runs for the 2nd wicket as Saurashtra ended the 4th day on 195 for 2 with 177 runs to win. It was a great day of Vidarbha as they are on the verge of winning their match against Uttarakhand. Starting day 4 on 559 for 6, Sarwate reached his century and was dismissed for 102. Vidarbha took a lead of 274 runs in the first innings. In their second innings, Uttarakhand openers Vineet Saxena and Kaushal added 72 runs for the opening wicket before Umesh Yadav and Sarwate broke the backbone of Uttarakhand batting line up to reduce them to 152 for 5. Brief Scores: Uttarakhand 355 in 108.4 overs (Saurabh Rawat 108, Avneesh Sudha 91, VS Panwar 67, Umesh Yadav 4/90, Wakhare 2/46, Gurbani 2/81) and 152 for 5 in 57.1 overs (KV Kaushal 76, Avneesh Sudha 28, Umesh Yadav 3/22, Sarwate 2/49) trail Vidarbha 629 in 184 overs (Wasim Jaffer 206, Ramaswamy 141, Sarwate 102, Wadkar 98, Dhanraj Sharma 3/101, Mayank Mishra 3/110, Sunny Rana 2/107) by 122 runs. The fourth day saw Saurashtra fight back strongly. 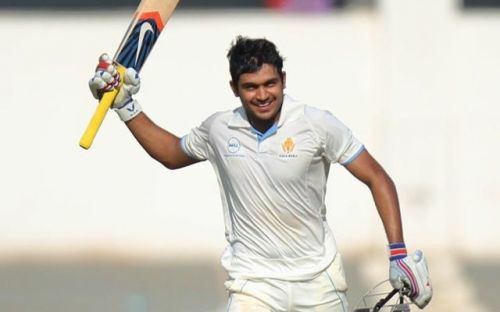 Uttar Pradesh was bowled out for 194 runs in their second innings setting a target of 372 runs to win for Saurashtra. In the chase, Saurashtra openers, Harvik Desai and SS Patel, added 132 runs for opening wicket. The second wicket partnership of Desai and VM Jadeja put on 54 runs as Saurashtra ended day 4 on 195 for 2. Brief Scores: Saurashtra 208 in 66.4 overs (Desai 84, Mankad 67, Yash Dayal 4/55, Shivam Mavi 3/40) and 195 for 2 in 67 overs (Desai 83*, SS Patel 72, Akshdeep Nath 1/5, Shivam Mavi 1/60) trail Uttar Pradesh 385 in 103.3 overs (Rinku Singh 150, Saurabh Kumar 55, Shivam Mavi 42, Unadkat 5/86, DA Jadeja 3/111) and 194 in 72.1 overs (Mohammad Saif 48, RS Rawat 37, Upendra Yadav 35, DA Jadeja 4/53, Sakariya 3/38) by 177 runs. Starting day 4 on 45 for 3, the nightwatchman Ronit More was dismissed. The captain Manish Pandey and Karun Nair put on unbeaten 129 runs for the 4th wicket. Manish played a captains' knock of 87* while Karun Nair contributed with 61*. Brief Scores: Karnataka 263 in 87.4 overs (Vinay Kumar 83*, KV Siddharth 52, Rahul Chahar 5/93, Tanvir Ul Haq 3/50) and 185 for 4 in 47.5 overs (Manish Pandey 87*, Karun Nair 61*, Aniket Chaudhary 2/32, Mahipal Lomror 1/19) beat Rajasthan 224 in 77.1 overs (Bishnoi 79, Lomror 50, A Mithun 3/48, K Gowtham 3/54) and 222 in 67.2 overs (Robin Bist 44, Lomror 42, K Gowtham 4/54, Shreyas Gopal 3/52) by 6 wickets.